Edwin M. Goldsmith, the second son and third child of Abraham Goldsmith and Cecelia Adler, was born on April 10, 1864. 1 As we have seen, for many years he and his brother Milton worked together in their father’s clothing business in Philadelphia, A. Goldsmith & Sons. 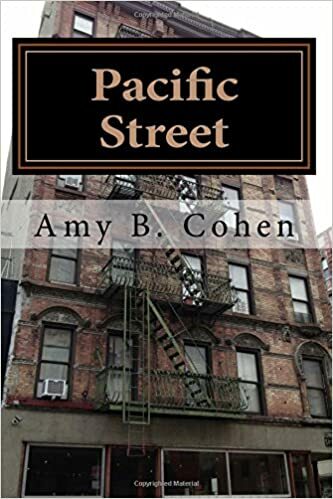 But in the 20th century and especially after their father died in 1902, their lives took separate and quite different directions. Whereas Milton focused on his writing and worked in advertising in New York City, Edwin stayed in Philadelphia and became an inventor. 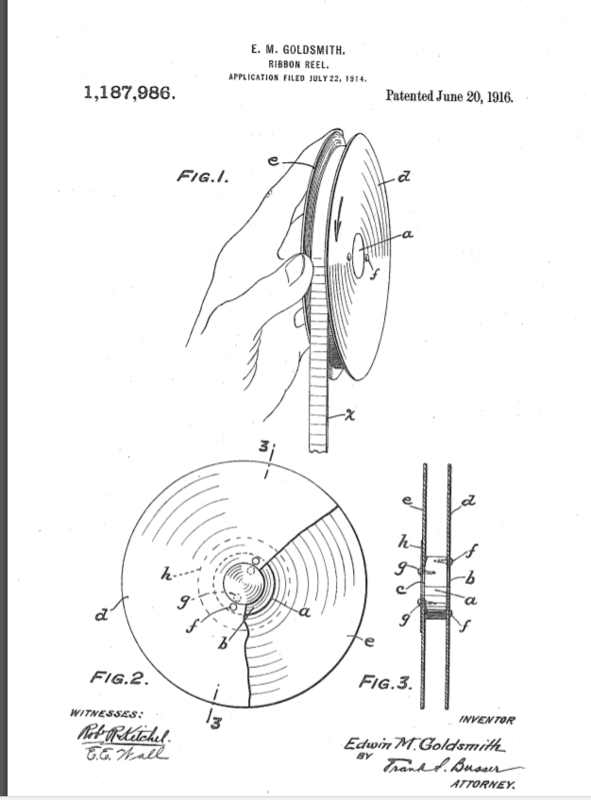 Between 1900 and 1933 he was awarded 23 patents on a wide range of inventions. But like his brother Milton, he relied on a more conventional career for income, in his case working as an executive in a textile company. 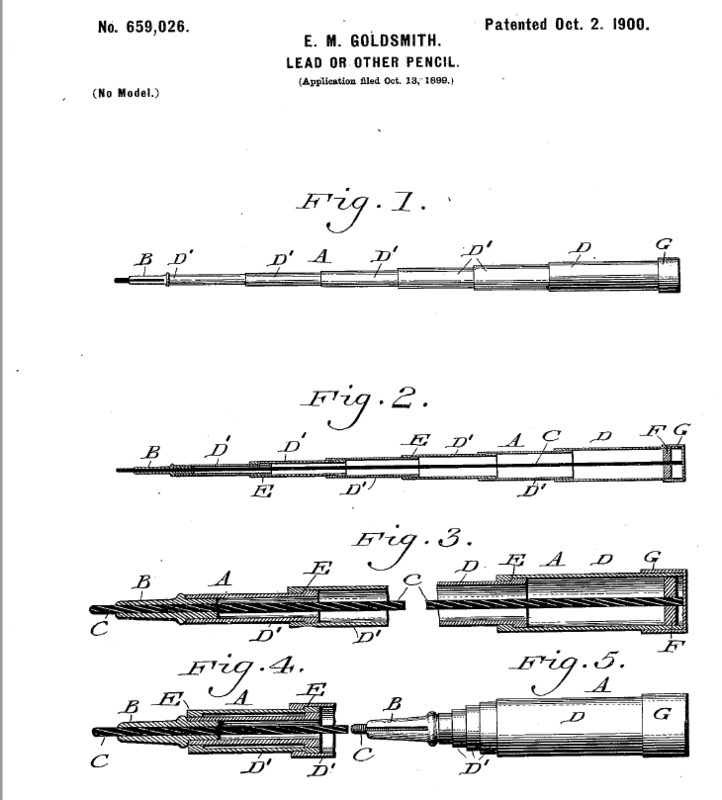 My invention consists of a lead or other pencil formed of a telescopic or collapsible barrel and means for connecting a length or piece of lead or marking material therewith whereby as said lead or material is worn away it may be exposed to present a fresh portion by the reduction in the length of the barrel, said piece having one end movably guided in the tip of the pencil and its other end rigidly held in the opposite end of the barrel whereby it cannot be detached through said tip. In other words—a retractable pencil! Among his other early inventions were a method for holding a cylindrical cake of soap to maximize the use of the soap;4 a savings-bank coin-operated clock; 5 a pencil sharpener designed to prevent the breaking of the point of the pencil;6 a device for carrying a pocketbook or purse;7 and the design of memorandum or account or other books that facilitated turning pages to get to a new leaf. 8 Obviously Edwin was interested and skilled in creating a wide array of products. The object of my invention is to provide a reel for ribbons that may be readily manipulated to effect or facilitate the winding upon, or unwinding from, the reel of the ribbon, and to construct the same so inexpensively that it will be practicable to give the same away with the ribbon as an inducement for the latter’s purchase. After the war, life returned to normal for the Goldsmith family. On July 23, 1920, the Philadelphia Evening Public Ledger reported that Edwin and his family were “passing the summer at their bungalow, in Longport, N.J.” 21 On the 1920 census, Edwin, Jennie, and their two sons Henry and Edwin, Jr., were listed as living in Philadelphia. Strangely, Edwin was now listed as a chocolate manufacturer. But that must be an enumerator error, as the 1921 Philadelphia directory continued to list Edwin as the secretary-treasurer of Friedberger-Aaron. That same directory lists Henry Goldsmith as a manager at G & O Manufacturing, a company that manufactured automobile radiators; the 1920 census listed Henry as a radiator salesman.22 Edwin, Jr. must have still been in school as he is listed without an occupation; he was eighteen in 1920. UPDATE: It turns out that Julian was related by marriage to Cecile. His mother Clara had a brother Sidney who was married to Edwin’s sister Rose. See more here. Cecile and Julian’s first child was born on August 9, 1916, a daughter named Jean Claire Simsohn. Two years later on December 10, 1918, their son Julian Stern Simsohn, Jr., was born. On the 1920 census they were all living in Philadelphia, and Julian Sr. was working as a chemical engineer. Thus, by 1920 Edwin Goldsmith and his family were all doing well in Philadelphia. He had continued his work as an inventor, and he had a son Henry and a son-in-law Julian who were both chemical engineers. Edwin and Jennie had two young grandchildren. They all seemed to be living comfortably. What would the next decade bring them? 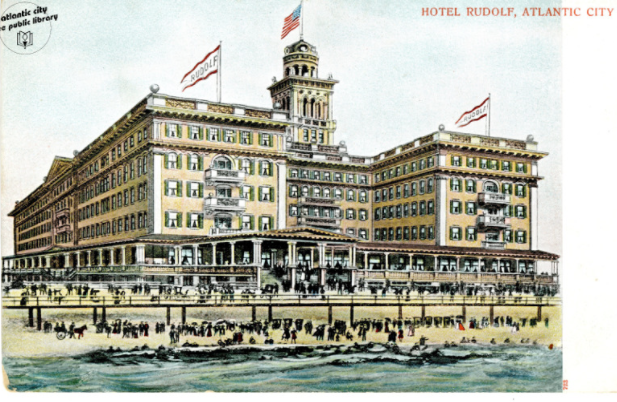 This entry was posted in atlantic city, Genealogy, Goldschmidt/Goldsmith, New Jersey, Philadelphia and tagged atlantic city, Edwin Goldsmith, Goldsmith, patents, Philadelphia by Amy. Bookmark the permalink. It is nice to read about a family doing well. Yes, there are enough sad stories out there for us to discover. Having happy ones now and then takes that edge off. What a versatile family the Goldsmiths were! Edwin, the inventor, fascinated me with his inventions. They were not all very practical like one of the telescoping pencil. But they all revealed the mind of one with great engineering skills. Looking forward to read the next episode, Amy! Thanks, Peter. Yes, it was quite interesting to go from literary Milton to Edwin the inventor! Thanks, Sharon! This family is fun to research! I don’t think literary Milton and Edwin the inventor were too different. They used their minds to entertain and help others. Seems like Edwin’s family enjoyed a good life. Hope it continues. True, they both exhibited creative minds. I wonder whether Edwin chose a different path just to be different from Milton. Or they followed the paths they were chosen to follow. I guess I am too much a believer in free will to think that way! I want to live with my cook and maid in that hotel for an “extended stay”! 🙂 So I guess the career changing didn’t hurt his finances? That is one thing that hasn’t come up for me before in research–dealing with what happens with a second or multiple residence household. That could complicate things in finding someone. If my relatives had another home, it was generally a lake cottage not all that far from home, but there have been some cases where they seemed to be in Michigan, Florida, Michigan, you know. Wouldn’t it be fun to be an inventor? I always have ideas I think would sell but lack the engineering knowledge necessary for putting together the sketch and model. To have the ability to put it together like that is wonderful. The second home thing hasn’t come up for me before—if someone had one, it didn’t appear on the census as it does here. Lucky Edwin. I don’t know if the money came from his inheritance, his inventions, or his job, but it does appear that they were quite comfortable. I just typed out a long response and WP “rebooted” on me, the stinkers. And it’s late, and I am hungry for the P.F. Chang’s we picked up for dinner. Yes, Edwin was very lucky. It really gave him the freedom to work on his inventions and business pursuits. Well, that’s annoying! Enjoy dinner. I have an inventor ancestor or two – fascinating what they come up with! Looking forward to part 2. Thanks, Debi. It certainly isn’t the way my brain works. I’m also looking forward to part two. I had no idea my great uncle Edwin was an inventor. I’d love to see what you have about his children and grandchildren. Keep moving forward by clicking next. They’re all there!